Robot Punctures Can Of Bear Repellent At Amazon Warehouse, Sickening Workers The can contained capsaicin – the chemical that makes chili peppers fiery. The incident comes amid scrutiny of conditions at the sprawling warehouses used to deliver goods at ever-faster speeds. 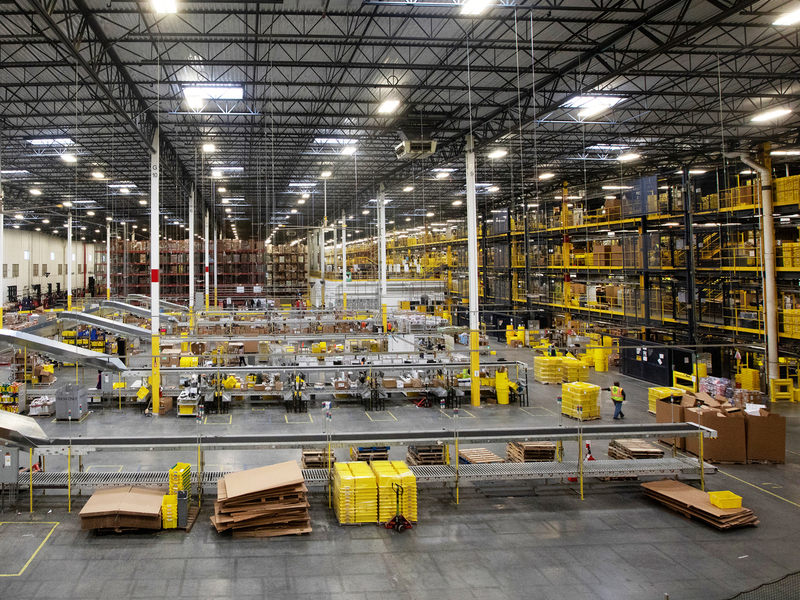 Workers at an Amazon fulfillment center in Robbinsville, N.J., were sickened on Wednesday after an automated machine punctured a can of bear repellent. The warehouse is seen here in June. Twenty-four workers at an Amazon warehouse in New Jersey were taken to area hospitals after being exposed to bear repellent on Wednesday morning, when a robot punctured a can of the aerosol spray. One woman was reported to have been critically injured in the incident, which caused at least 54 workers to have difficulty breathing, and burning throats and eyes, NJ.com reports. The warehouse, which is ventilated, measures about 1.3 million square feet. "All of the impacted employees have been or are expected to be released from hospital within the next 24 hours. The safety of our employees is always our top priority and a full investigation is already underway. We'd like to thank all of the first responders who helped with today's incident," Amazon told news outlets in a statement Wednesday night. The incident happened at an Amazon facility in Robbinsville, outside of Trenton. A spokesman for the township told NJ.com the trouble occurred after an automated machine punctured a 9 oz. can of bear repellent, which contained capsaicin – the chemical that makes chili peppers fiery. The spokesman said hundreds of workers are at the facility during a regular shift, and that the airborne event affected only a portion of the facility's third floor. The Occupational Safety and Health Administration tells NPR that it is investigating the incident, which comes amid scrutiny of safety practices and working conditions at the sprawling warehouses that Amazon and other companies use to store and deliver retail goods at ever-faster speeds. But those replies, tongue in cheek as they are, point to serious concerns. While human workers were sickened yesterday by a robot's error, in the future many of those workers may be replaced by robots that never sleep and aren't bothered by fumes. The Amazon facility's workers are not unionized, but Stuart Appelbaum, president of the Retail, Wholesale and Department Store Union, issued a statement critical of the company's labor practices. "Amazon's automated robots put humans in life-threatening danger today, the effects of which could be catastrophic and the long-term effects for 80+ workers are unknown," he said. "The richest company in the world cannot continue to be let off the hook for putting hard working people's lives at risk."